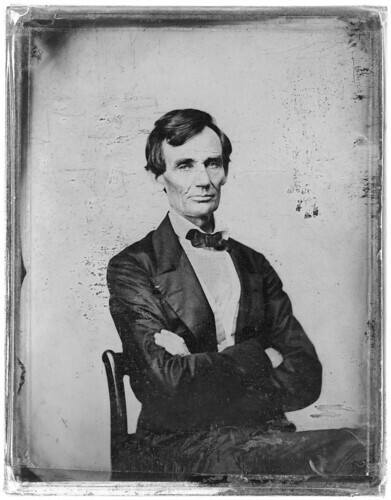 It's Lincoln's birthday and the Library of Congress has unveiled new scans of the first photographed presidency. The 16 newly-scanned photographs are part of a set of 22 photographs from the Library of Congress being hosted at Flickr Commons, a home within Flickr for photographs with no known copyright restrictions. Let the remixing begin. The newly available photographs include a stereoscope — two photos meant to create a 3-D effect — where the president has what looks like a fade haircut and a scan of the glass negative of the portrait that is the basis of his image on the five-dollar bill. In a sense, Lincoln and image making in America came of age together; the increasing production and proliferation of photographs and print portraits coincided neatly with Lincoln’s political rise and not only illustrated but likely influenced his growing prominence.